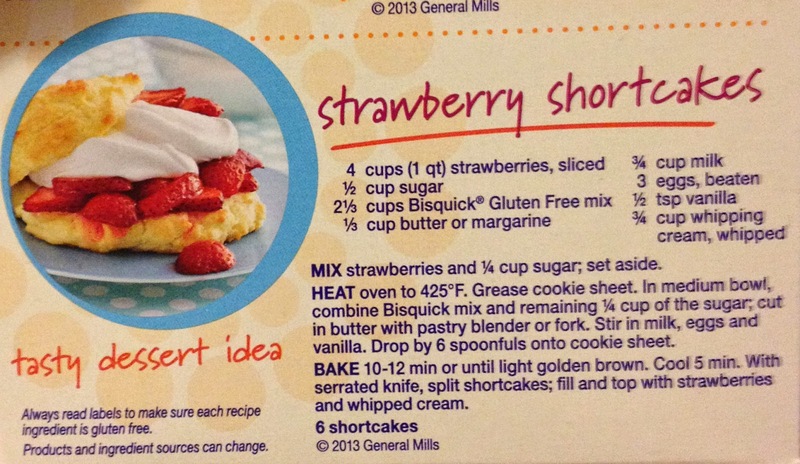 The Spinsterhood Diaries: Weekend Spinster Food: Strawberry Shortcake. I'm not sure why, but sometime in the middle of last week I started having a very serious craving for strawberry shortcake. Being gluten free, however, buying shortage at the grocery store was out of the question. Thankfully for me, though, the good people at Bisquick make a Gluten Free mix. Just so we're clear that I didn't make up this recipe, I've posted a picture from the box on this post. However, I am proud to say that I did make my own whipped cream, and it was really amazing. Being the spinster I am, I knew that if I made this recipe without any company to share it, I would eat it all while I sat intermittently at my patio table and on my sofa. So, before I made any sudden moves toward the kitchen, I texted Megan to see if she'd be interesting in spinstering together over a little dessert. She was totally down. Saturday morning, after going to the Atlanta DMV (which is weirdly located in a random shopping mall? ), I started in on my mission. Of course, I had to take some photos. Stage one: I rinsed the strawberries and then cut them all up, putting them in a big, round, glad ware so I could stir them and store them. Next, I added the sugar and stirred them up, putting them in the fridge. The recipe doesn't say this, but I find that the longer the strawberries sit, the juicer they get, and that, my friends, is the key to Strawberry shortcake in my estimation. Next, I made the home made whipped cream. i'd bought some cool whip at the grocery store just in case I was inept at making whipped cream or it turned out to be unduly complicated, but in the end I didn't need it. I just wanted a video on how to make whipped cream from Real Simple, and voila! It turned out great. I should note, however, that I used the confectioner's sugar because I thought it would be lighter and not grainy. Let it be said that there can be no real comparison between fresh whipped cream and cool whip. After a bit of dawdling and sitting on the balcony in a folding chair that insists upon folding up every time I sit on it, I decided to start in on the shortcake recipe. Now, I have to say a few things about the shortcake recipe. Firstly, like a lot of gluten free baked goods, this comes out a little dry. So, my suggestion is to make more of the strawberry mixture than you think your'e going to need, and let it sit for quite some time so it'll produce as much juice as possible. The actual taste of the strawberry shortcake is good, it's just a tad dry. Secondly, There is the matter of cutting the butter in. I didn't really know what that meant, and the recipe didn't really call for "softened","melted", or "room temperature" butter. As such, cutting the butter in was fairly difficult. So, be forewarned if you're making this recipe that you may want your butter to be a little softer than it would be straight out of the fridge. For some reason I got seven lumps instead of six. That, and the dough was really sticky on my hands. a little bit was wasted because I couldn't get it off my hands. When the little shortcakes were golden brown, I took them out of the oven as directed and put them on a little plate to wait for Megan's arrival. Megan and I went to have a little Mexican food for dinner where we discussed how difficult it is for us to actually be motivated to take our trash out. Don't worry, though, because we were discussing trash, I did take mine out. When we came back, even though we were both too full, Megan and I devoured two of the seven servings of strawberry shortcake. I, for one, thought they looked beautiful. I suppose I don't need to tell you this, but I've been eating the other five servings all by myself and often in bed. This, my friends, is what spinstering is all about. I hope you've been inspired to have some strawberry shortcake for your spinsterly self. At the very least, you should try making some home made whipped cream. It is well worth the effort and has the extra benefit of growing your biceps...and probably your triceps.